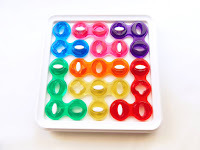 Here's real proof that Hanayama can make really interesting puzzles besides the Cast Series. Their Meiji Chocolate Series has three types of chocolate: White, Black and Milk. My choice was the latter - you guessed it, it's my favorite. If I didn't know it's a puzzle I could've tried to take a bite, that's how real it looks. 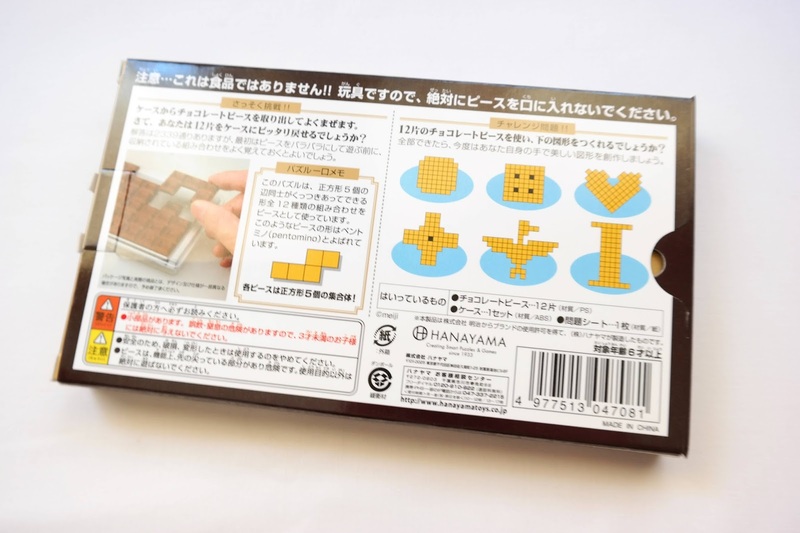 The puzzle comes packaged just like your average chocolate bar: A box made of paper. Inside you'll find a clear box with 12 puzzle pieces. These pieces represent all possible pentominoes (5-unit pieces) and together they can form a 10x6 rectangle, but that's not all...Besides this rectangle, which is the exact size of the provided case, you can also try to build with the 12 pieces many other different shapes and figures. Are you up for the task? There's a slight issue with the puzzle's package - it's written almost entirely in Japanese - but even I, whose knowledge of Japanese is very close to zero, can decipher pretty much everything you need to know in order to fully enjoy this puzzle. The original shape (the 10x6 rectangle) has a whopping 2339 different ways to pack the pieces inside the frame. On the back of the box there's also a few other interesting shapes to build with the 12 pieces, and if that's not enough for you there's a small paper sheet inside the box with an extra 12 shapes to solve (again, all to be made using the 12 pieces). Difficulty-wise, the puzzle has a moderate difficulty. It's rated as a level 7/10, and I completely agree. The main challenge, to be solved using the clear case, is relatively easy, considering there's a lot of possible solutions. I was able to solve one of those 2339 solutions in under 5 minutes. Not all of them are as easy, though. I solved two other solutions, both between 5 and 10 minutes. So far, I was unable to solve any of the other shapes. 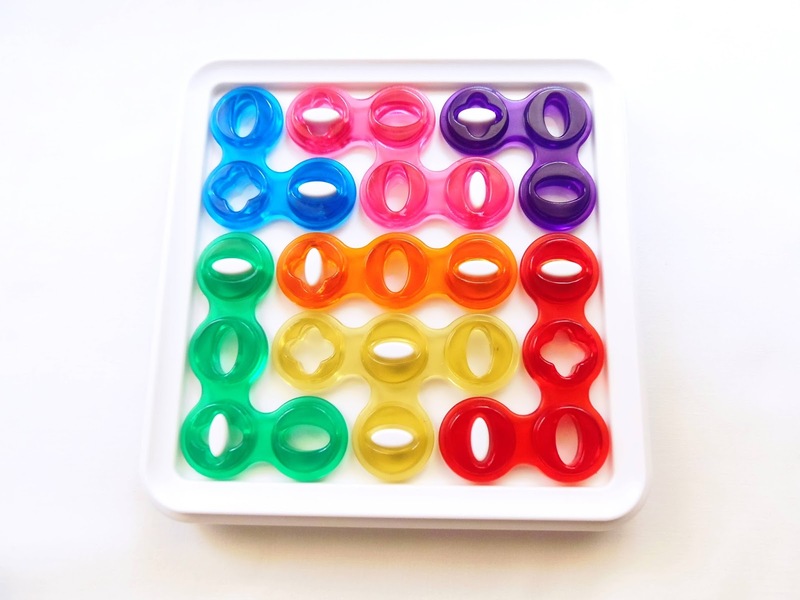 They are indeed much more challenging than the rectangle shape, mostly because you have to solve them without the help of a tray. This may not sound important, but having a frame with well-defined borders is a big help to visualize what you're supposed to achieve. 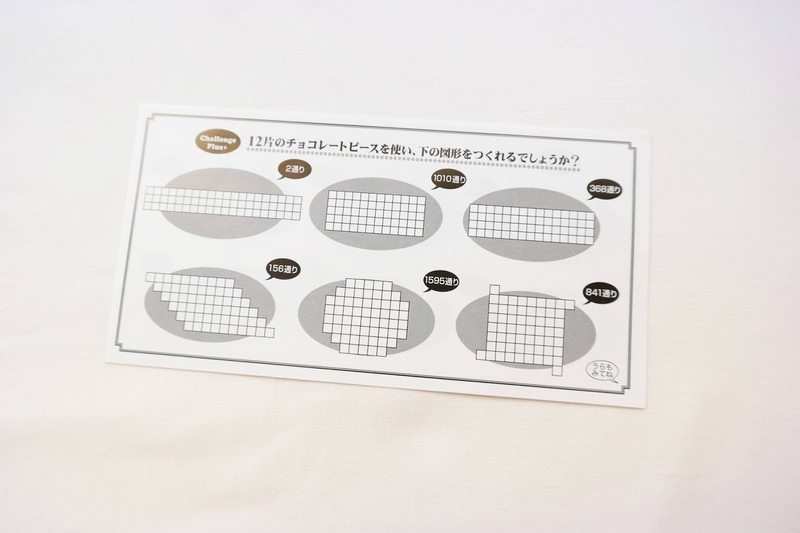 Not having that visual aid is a really tough challenge, since you have to be constantly checking and counting the limits of your shape to see if you're doing it right. 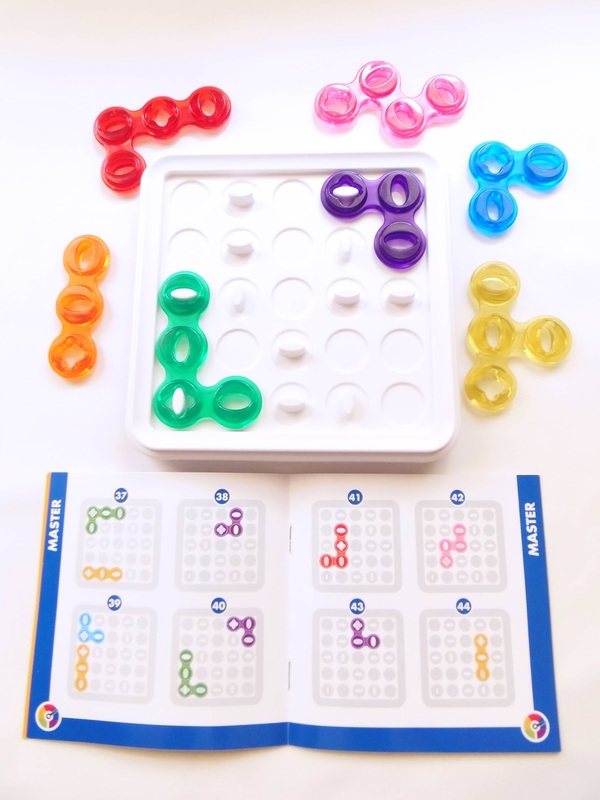 It's a great puzzle to improve your logic skills and hand-eye coordination. 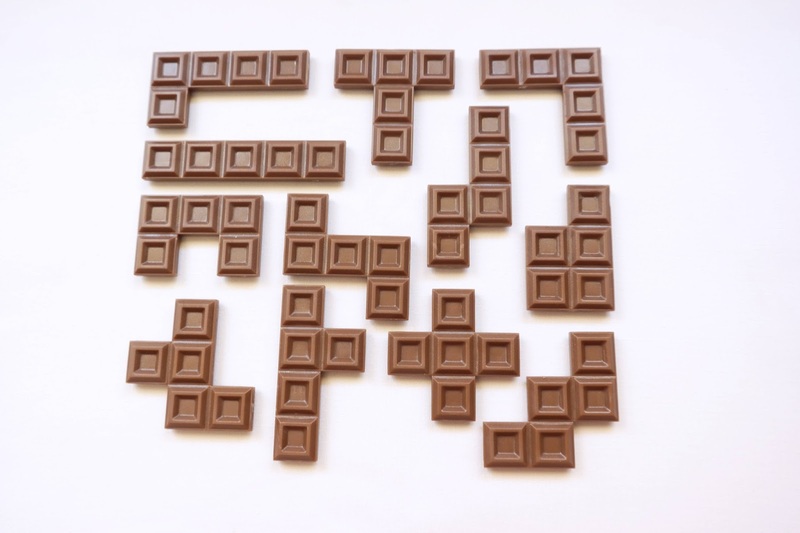 I recommend having a real chocolate bar around for when you attempt to solve this puzzle, because it is really mouth-watering. 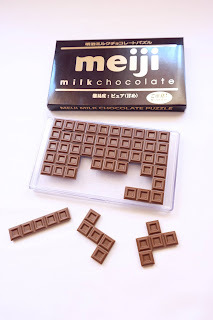 If you overcome this small problem, then you will certainly enjoy every bit of Hanyama's Meiji Milk Chocolate without leaving a bitter taste in your mouth. Also, this is a perfect gift to pull a prank on someone with a sweet tooth. Availability: You can find the delicious Meiji Milk Chocolate at PuzzleMaster - your favorite confectionery. 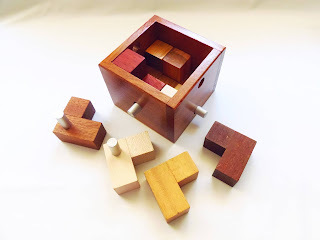 Here's another great Constantin puzzle that is pretty deceiving, in the way that it looks like a simple and easy puzzle, but in reality it can be much more difficult than expected. 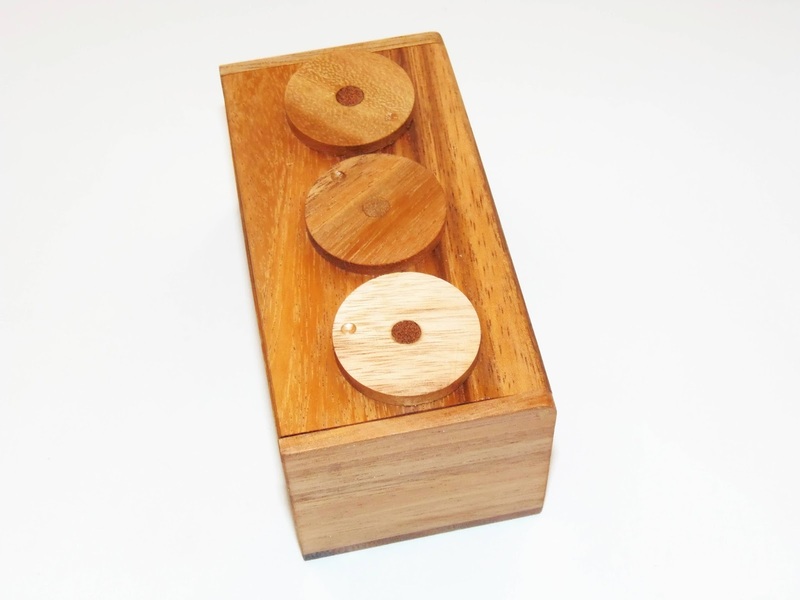 With a superb and mesmerizing design, this puzzle can lure you into a trap if you think it's a walk in the park. The 7 Sterne (sterne is German for star) looks absolutely gorgeous with its impressive arabic-like pattern. Seen from above, the pieces form a circle with seven six-pointed stars. At first glance, it appears that the pattern is comprised of 30 identical pieces. That's an illusion, though, because it's actually 8 uniquely-shaped pieces, each a different configuration of those smaller pieces joined together at different angles. Not so simple now, right? 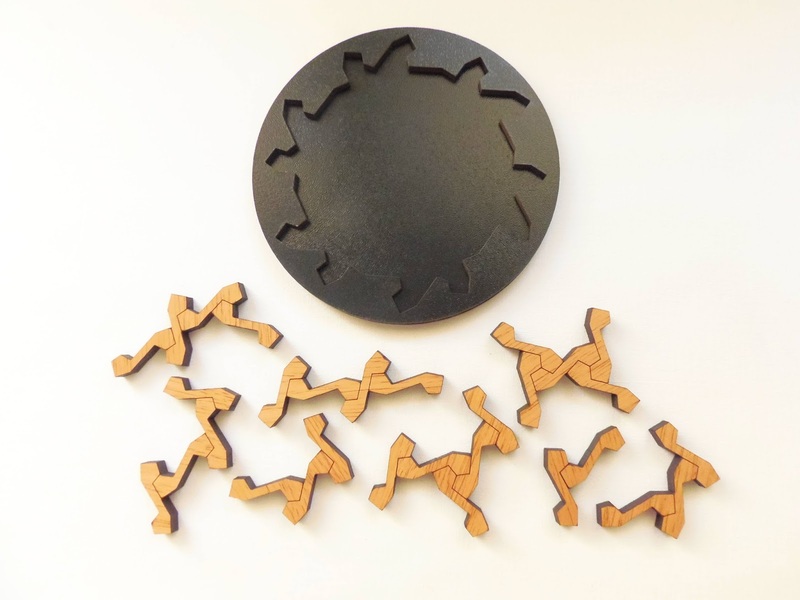 Made with laser-cut wood, both tray and pieces, the puzzle feels very light in the hand. The pieces have a lighter shade tan the tray for maximum visual effect and the size is a little smaller than I would've liked, but still acceptable for a packing puzzle: it measures about 10cm in diameter (4"). Now, the difficulty is rated as a level 8/10, but I actually found it slightly tougher than that - over an hour and a half to solve it. For many, this could easily turn into quite a frustrating puzzle, given the unusual shape of the pieces. It's very difficult to see where each piece should go. 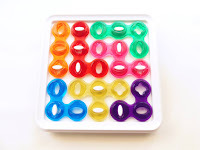 Even so, the tray gives you a small help, since the edges have the same shape as the extremities of the pieces, making it a tad less difficult. Other than this, there's little to help you solve this puzzle. It's a hell of a challenge, that much I can tell you, and definitely not for beginners. 7 Sterne is a magnificent puzzle! Yes, it's difficult, really really difficult, but the rewarding feeling you get you finally place that last piece is totally worth the extra effort. Also, for its beautiful design, it can be a great decorating object. 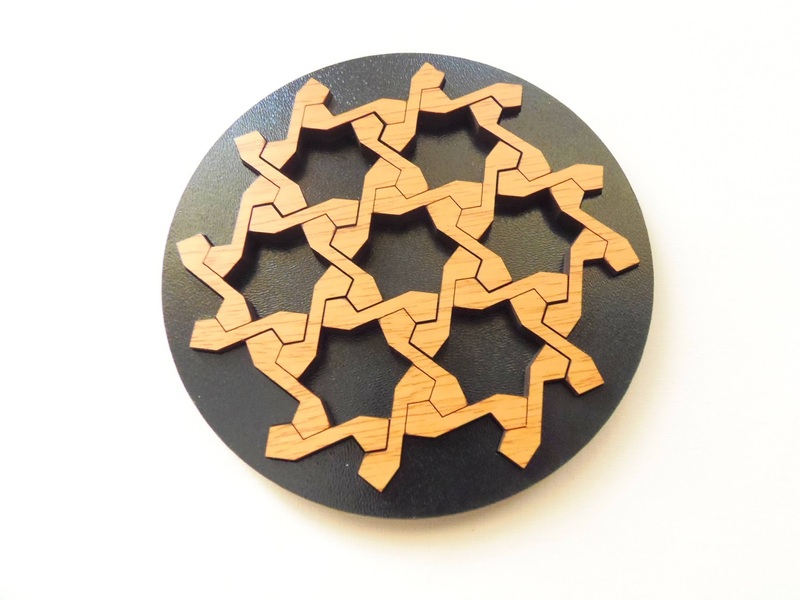 Availability: You can find the 7 Sterne puzzle at PuzzleMaster for about $17 CAD. Other interesting designs from Constantin are also available. Here's a type of candy that's not harmless to your health in large quantities. In fact, the more you take the better for you. As advertised on the box, these candies are free of sugar and calories but contain 100% vitamin FUN. 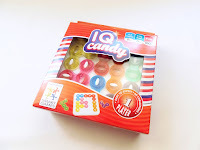 Made at SmartGames by confectioner Raf Peeters, the IQ Candy will be the delight for all kids and adults alike. The IQ Candy comes in a different package than the others in the IQ series. A little bigger, but still practical enough to take it with you on your travels. 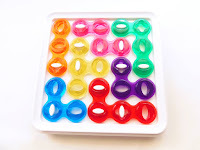 The tray measures about 15cm in diameter (6"), and has a clear plastic tray to keep the pieces from being lost. 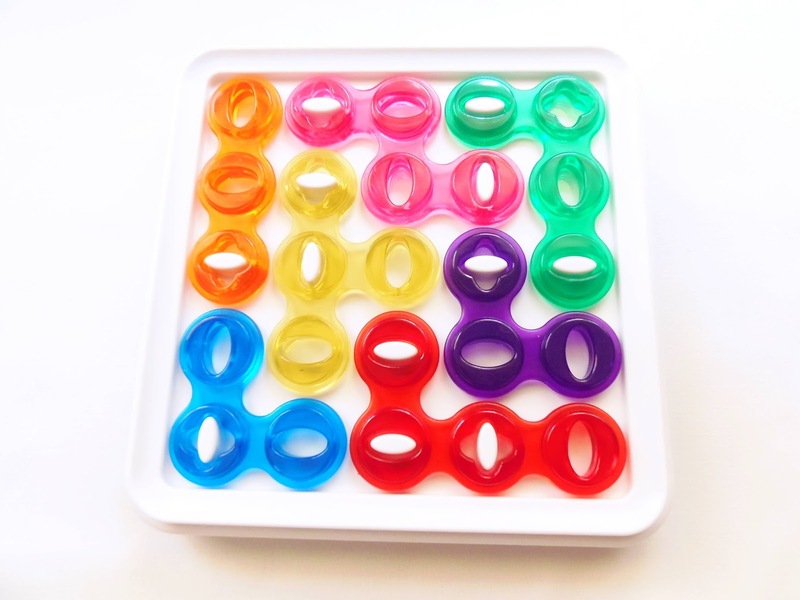 The game consists of seven candy-colored pieces in different trominoes and tetrominoes shapes. All pieces fill an entire 5x5 grid with no empty spaces, but the grid itself has something different from the regular 2D packing puzzles, as about half of the 25 spaces have vertical and horizontal pins on it (12, to be exact). The pieces themselves have holes, but they're placed at different directions, like the pins, and will only fit on certain places. 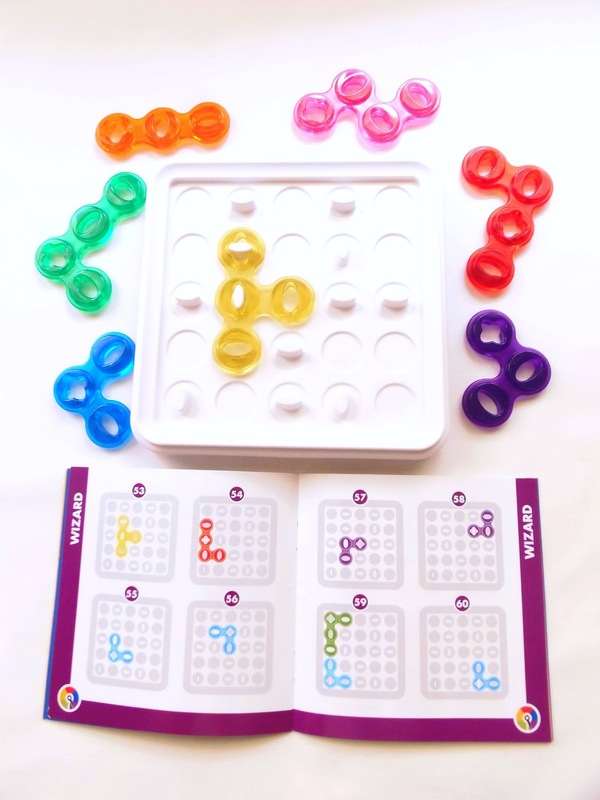 What's great about the IQ series is that the games have very simple and easy to understand rules, so you will only need a couple of minutes to familiarize yourself with the game. First, before starting with any challenge, you have to make sure the game board is placed in the correct orientation (the only corner with a pin should be at the bottom left). 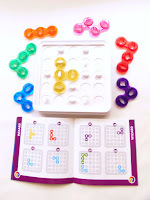 Then, you just need to place the pieces as shown in any of the 60 challenges found in the booklet and solve the puzzles. On the first challenges you only need to place a couple of the remaining pieces on the tray, but the harder ones will have just one or two pieces. There's only one solution per challenge. 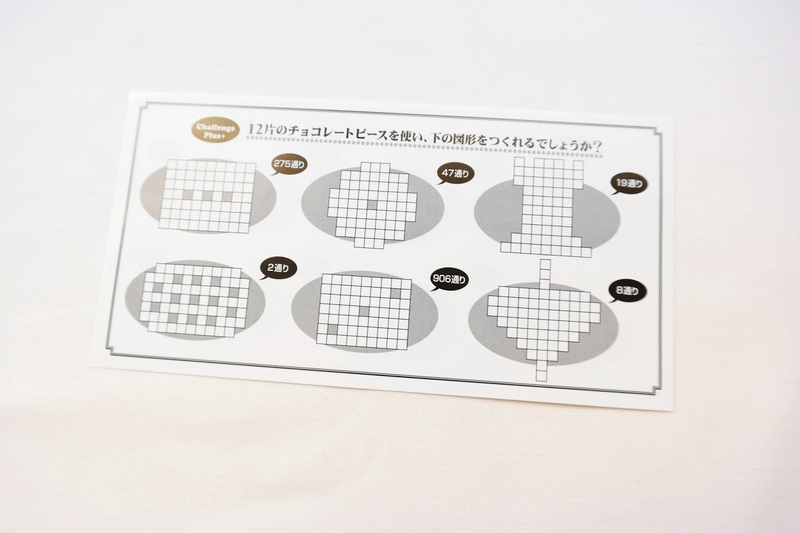 You can also try to solve puzzles that aren't on the booklet. Start with one piece and work your way until all pieces are placed on the game board. You can place the pieces on the game board with either side and orientation. If a piece doesn't fit with a certain orientation, try flipping it. Besides the horizontal and vertical holes, each pieces also has a cross-shaped hole that fits on any pin, provided you place the piece as such. 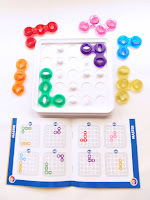 The difficulty level of the IQ Candy is not as difficult as you might think. The pins actually reduce the number of possible configurations, which makes it easier to solve the puzzles. Mind you, easier doesn't necessarily mean easy. Just less difficult than other puzzle games. 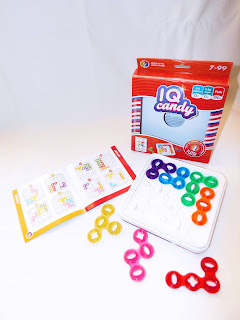 IQ Candy is a superb puzzle game. 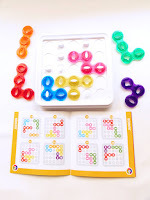 The design is magnificent, made with bright colors, and the pins in the game board is a nice change from the more common packing puzzles, which is a welcome variation. The taste is a little "plasticky", but the IQ Candy is worth every minute you spend with it. Playing with candy never felt this good. 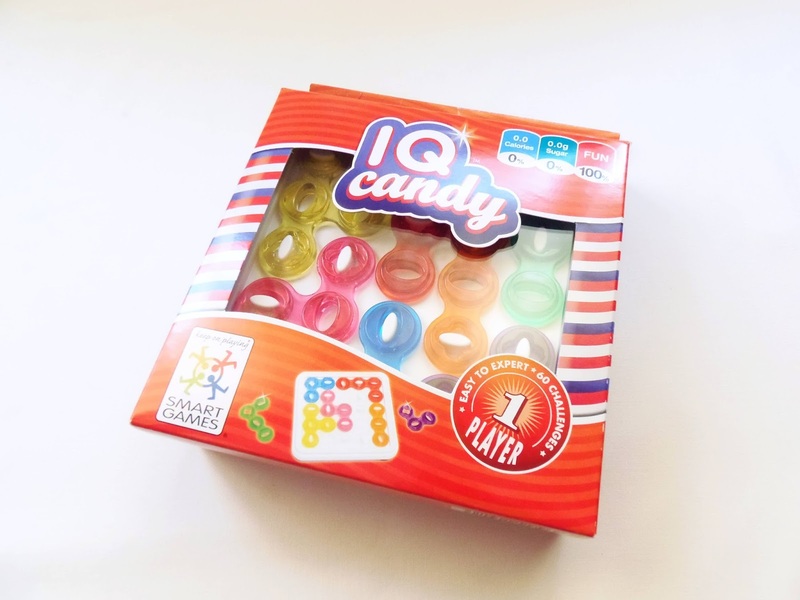 Availability: The IQ Candy is available from major online stores like Amazon.com or in Europe at Amazon.co.uk. Creative Crafthouse always makes interesting puzzles. Whichever type of puzzle you like, you'll probably find something that deserves your attention...and money. 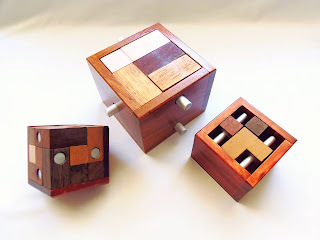 Puzzle Boxes are a great example of Dave Janelle's superb craftsmanship, and the Secret Combination Puzzle Box is a unique design that can be attempted by anyone. All the components of this puzzle box are made of high quality hardwood. It's a regular sized box, measuring 12.8cm in length, 6.5cm in width and 6.3cm in height (5" x 2.6" x 2.5"). The design is interesting enough to capture your attention, because of the three dials on the top of the box, but I found its overall design too bland. The dials should have been made with a contrasting color, or even with three different wood tones, to make it more visually appealing. Leaving the aesthetics behind, the whole mechanism works as it should. The dials turn smoothly and effortlessly, so it's up to you to find the correct sequence to easily open the lid. You have to find the correct position for all three dials simultaneously, otherwise the lid won't open. Now, in other circumstances, this could have been an extremely difficult puzzle to solve, since there are hundreds of possible positions and combinations the three dials could've had. Fortunately, for you and for me, the designer didn't want to make the mechanism more complex than it already was, so he settled for a simpler combination. You'll still have some discovering to do, but it won't take hours (unless you are very bad with puzzles). What you'll have to do is simply try different combinations - some patterns. All I can tell you is that you can turn the dials in 90º angles, and you'll eventually find the correct sequence if you're persistent. You can hear a ball rattling inside, but you'll have to decide if it's part of the mechanism or just another red herring. 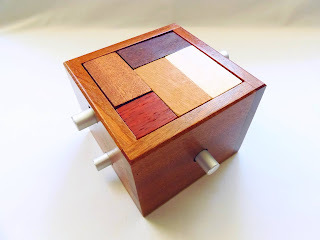 Janelle's Secret Combination Puzzle Box is a very original design, a bit different from the trick puzzle boxes, where all or most of the mechanism is hidden from view and you have to go at it by relying on other senses. 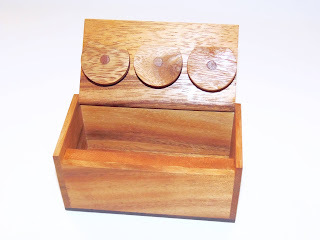 This one is more interactive and because of its simple design anyone can try their luck at opening it. Availability: The Secret Combination Puzzle Box is available at PuzzleMaster for just $20 CAD. Check out other creations by Creative Crafthouse. Siebenstein-Spiele has many interesting packing puzzles that go against any preconceived notions you might have on this type of puzzles. Some of these are quite unusual creations that will certainly baffle you and give you a run for your money. A Pair of Twins is one of such puzzles, but be careful not to be deceived by its true goal. 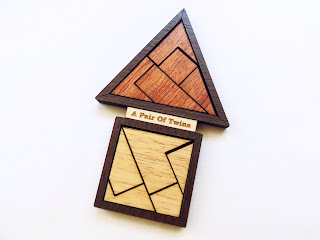 The design of the puzzle is made so that two sets of pieces are presented in two distinct shapes, a triangle and a square, both sets with completely different pieces. For contrast, one set is made with a light wood tone and the other in a darker shade. 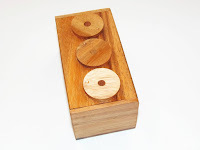 This is a rather small puzzle measuring 12cm x 7.5cm (4.7" x 3"). The pieces are laser-cut from plywood. The solving experience on this puzzle was almost ruined by poor instructions, plain and simple. The instructions come in English and German (the native language of the designer, Jürgen Reiche), but what it says in German is completely different from what it is written in English - Good thing I know how to use Google Translate. (Click to Enlarge) - The "Instructions"
This, of course, wasn't noticed by me at first. Since I don't know German, I trusted the English instructions, which merely ask you to "Cover up all pieces of one colour with all pieces of the other colour". Now, anyone would probably interpret this as to cover one shape with the pieces of the other shape, and vice-versa...And that's what I did for probably 15/20 minutes, until I started to suspect that I wasn't going far with the current task at hand. Simply put, the pieces of one shape can't possible make the other. So, my guess was that I was missing something. Indeed, I was. After looking attentively at the instructions and noticing that the German instructions were a lot bigger, I suspected that something could've been lost in translation. Not only only something was lost, but they gave a completely new meaning to the description of the puzzle. It's like it was written by two completely different persons. 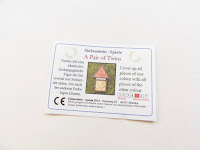 Roughly, the German translation made with the online tool says that you have to find an identical, congruent figure that can be made with both sets of pieces, for one color as well as the other. That's a little different from what's asked in English, wouldn't you agree? 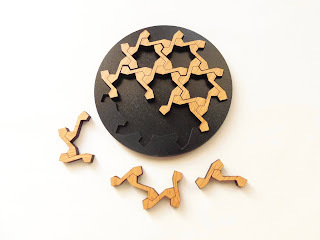 After discovering the true goal of the puzzle, it didn't take me long to figure out the correct shape you must build with both sets of pieces...And voilá, the two figures are identical in shape and size, whether you make them with the dark pieces or the light-colored pieces. 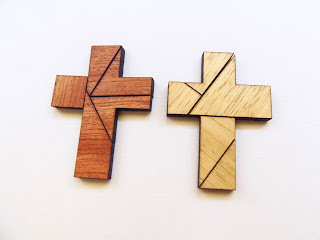 It can be a little challenging to figure out the correct shape, but once you do, it's pretty easy to solve both puzzles. Sometimes, poor instructions can make a difference of a good puzzle and a bad one. Fortunately, I was able to minimize the damage, and a simple translation cleared the subject. From now on, I will be more alert whenever I have to follow instructions by this manufacturer. I still respect Siebenstein's work, as their puzzles are magnificently made. Just have to be more careful with what I read. Availability: You can find the puzzle A Pair of Twins at PuzzleMaster for $18 CAD. 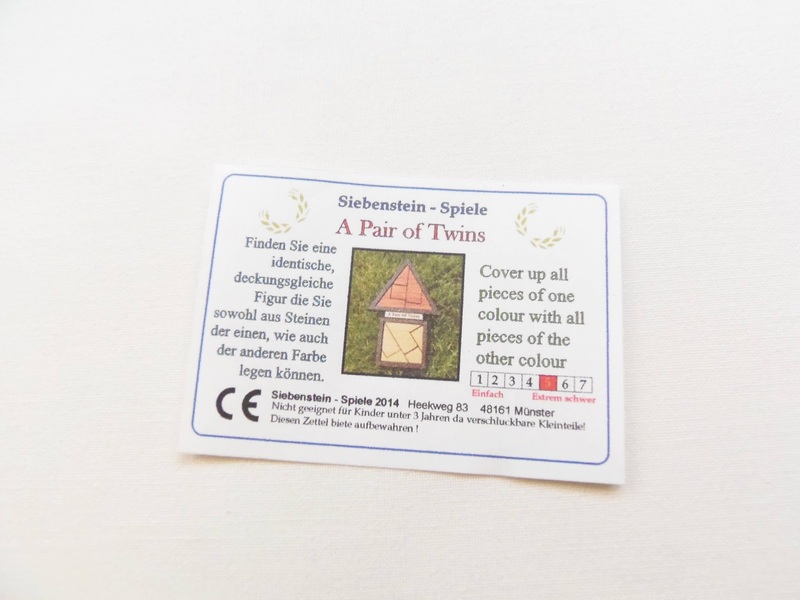 Others from Siebenstein-Spiele are also available. I'm used to being pleasantly surprised whenever I play with a new Constantin puzzle, but I still marvel at his craftsmanship and superb quality of his designs. The Nagelbox 30 (Nagel=Nail) is another one of Constantin's excellent creations...and this is a hefty one - perfect as a center piece on a coffee table for guests to play with. The first surprising fact about the Nagelbox 30 is its huge size. It's quite unusual for a 3D packing puzzle to be made in such a large size. This one measures 11.5cm (4.5") in diameter (14.5cm (5.7") if you count the protruding poles) and 9.3cm (3.7") in height. 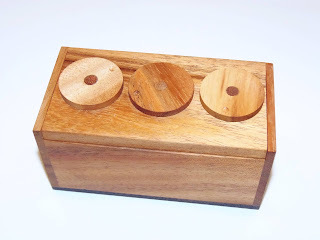 Also, because the puzzle is made from 100% natural wood, you can expect it to weigh quite a bit. The design is a perfect mix of metal and wood, kind of like in the same way as two other Constantin's puzzles, the Pack + 1 and the Pilled Logs. 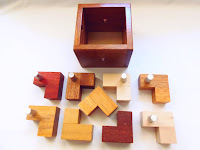 All three puzzles are made from many types of woods, hence the different colors, and the poles are made of aluminum which reduces the total weigh of the puzzle considerably. All in all, it makes for a great looking puzzle. The puzzle consists of nine identical pieces (L-shaped trominoes), but some have metal poles attached to them and other don't. Actually, only three of the pieces don't have a metal pole attached. The other six are placed on the edges of the box and go through the holes strategically placed on its four sides. Also, the poles are attached at different parts of the pieces, so you need to choose wisely which ones to use. When solved, no piece shall be visible over the top edge of the box. Despite what it may appear, the puzzle is actually pretty easy to solve, mostly due to the nature of the pieces. They're all identical, and the ones that need to go through the holes with the poles need to be placed in a specific position, thus leaving very few possibilities for the remaining three pieces. Nevertheless, the solving process is still fun and enjoyable, and playing with pieces this big reminds me of those extra large LEGO blocks. Who doesn't like to play with LEGO blocks? I had a great time playing with the Nagelbox 30, even though it was a short time. The puzzle is superbly made with quality materials and I can easily recommend it to any puzzle fan, collector or not. This will also be a great one to start with 3D packing puzzles. 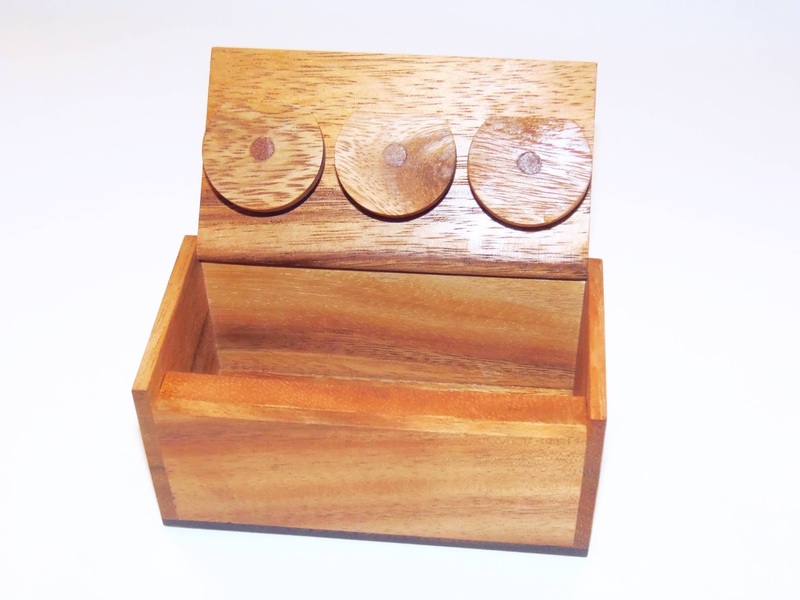 Availability: You can find the Nagelbox 30 at Brilliant Puzzles for $42.95 USD. Also, check out their selection of Constantin puzzles, and you might find yourself with a few extra puzzles on your collection pretty soon.